70 miles of San-Diego coastline has several beach spots featuring for the best tourist attractions in the country beside the warm weather, premium shopping and dining facilities and many more awesome activities. However, beach activity is unmatched, and there are beaches ideal for scuba diving and snorkeling, as well as there are beaches specialized for kayaking and surfing. Your beach choice depends on what you are hoping to get. Here is a list of 7 most beautiful and best beaches in San-Diego to save your research time. Coronado Municipal Beach is a combination of four different beach spots including Tideland Park, Centennial Park, Glorietta Bay Park and Coronado City Beach. The flat profile of the area makes it an ideal spot for kite-flying, that will keep the kidos busy and happy. 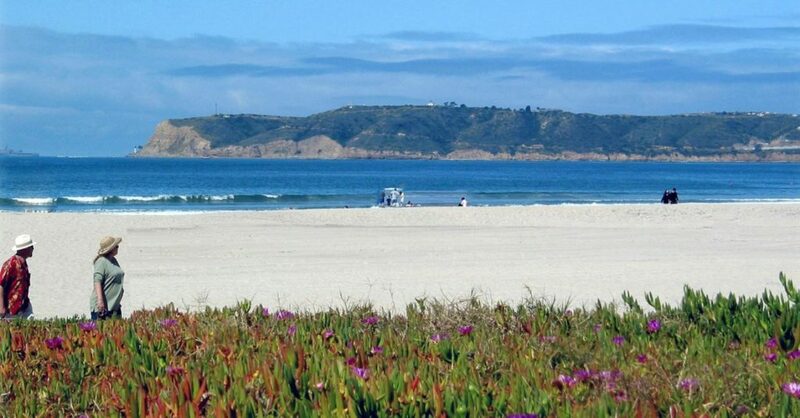 This family friendly beach area is located near the famous Hotel Del Coronado and can be easily reached by car, bus, taxi or shuttles through the San Diego-Coronado Bay Bridge. This is a perfect beach to bring your beach cruiser bike and explore the vast area of the beach. Having these cruiser bicycle accessories can make your beach cruising comfortable and fun. If you are a man looking to enjoy your time at the beach, have the best bike for men and explore San Diego beaches. Pacific Beach, also known as ‘The Strand’ is a two-mile-long stretch of beach-line located in between La Jolla and Mission Beach. This is a great place for long strolls and family activities, by the fame it attracts a large number of tourists, so this is a perfect beach with the crowd. Scuba diving equipment can be rented from the rental shops available on the beach, surfing is restricted to specific areas. 3.5 mile long broadwalk is a great tourist attraction too. The famous fishing spot Ocean Beach Pier is located on the other side of the Ocean Beach and to fish you don’t need to have a fishing license here. This pet friendly beach has a special area designed for dogs and your pet can run around without any leash here. Plenty of bars and restaurants make the spot great for food and drink. Surfing is fine in designated spots, and due to the strong rip current swimmers should stay close to the lifeguard towers. La Jolla Shores is famous for its family friendliness and attracts large crowd of locals and tourists regularly. For its easy access to the ocean and sandy bottom, it is one of the greatest beaches in the region for scuba diving lessons, paddle boarding and surfing. Nearby Kellogg Park offers a great short stroll with nice picnic spots. You may also visit the Steven Birch Aquarium close by. This special attraction in the North Pacific Beach is famous for sailboarding and surfing. 75 feet tall cliffs border this amazing beach and the whole spot is divided into two specialized zones: one for surfing and the other for swimming. Showers, restrooms and parking is available and the path to the beach is rocky. Not many people gather here, so those who wish to enjoy peace and quiet – near the sea, surrounded by the cliffs – this is the best and perfect place. Imperial Beach earns its great fame from hosting the US Open Sand Castle Competition during the summer. It is the southernmost beach in California and is located a little away from Tijuana in Mexico. This is the great haven for bird watchers featuring more than 300 species of birds. Swimming and surfing is great here, but you may also use one of the numerous trails for a nature hike. The pier on the beach is a great fishing spot and provides an astounding view of the Los Coronados Islands. Adjacent to the beach is a surfboard museum, so surfers can do more than just surfing here. Mission Beach is one of the most attracted beach spots in San Diego, not only for the for the spectacular ocean view but also for its great location. Famous Belmont Park is just nearby, and very popular Ocean Front Walk is only minutes away. Showers, restrooms, abundant on duty lifeguards and fire pits feature the well-organized services and facilities on the beach. Near the Belmont Park you will find the free public parking area. Many restaurant and bars on the Ocean Front Walk offer a great variety of delicious food and drinks.